The government of Pakistan has approved a project to improve food security and increase the resilience of livelihood of the livestock farmers to animal disease threats. 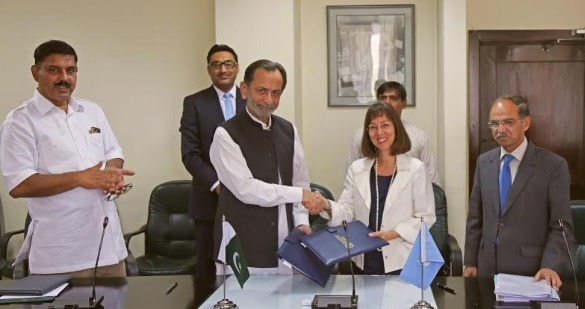 Food and Agriculture Organization of the United Nations (FAO) and Ministry of National Food Security and Research signed the USD 6.6 million project agreement in Islamabad titled “Risk based control of Foot and Mouth Disease in Pakistan. FAO addressing the request of the government of Pakistan will implement this project over the next 6 years to help curb Foot and Mouth Disease (FMD) in the country. The project will address FMD lab diagnosis, outbreak surveillance and rapid response, providing good quality vaccine for prevention, improving legal frame work and capacity building of the stakeholders. This will eventually curtail losses caused by the disease, increase productivity of livestock and improve livelihoods. Mr Fazal Abbas Maken, Secretary Ministry for National Food Security and Research signed the agreement on behalf of the government of Pakistan. FMD is the most prevalent and economically the deadliest infectious disease of cattle and buffaloes in Pakistan. Annual losses are estimated to exceed USD 692 million in terms of loss of milk production, treatment cost, body weight loss and mortality in calves. FAO has been working for the control of FMD in Pakistan since 2008. On a FAO-OIE FMD Progressive Control Pathway, Pakistan moved from stage 0 to stage 1 in 2009 and to stage 2 in 2015. The current project will move Pakistan to stage 3 and thus opening up further international markets for the export of meat and other livestock products.